Zelda is unconcerned with the latest snowstorm (which is predicted to dump another eight inches by tomorrow). 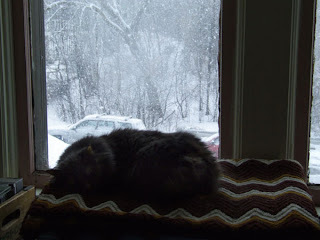 She's got a heated blankie; it can snow through July for all she cares. Last year at this time I was transplanting strawberries, and a week later I'd be planting peas, spinach, lettuce, carrots, radishes, beets and onions. By the end of April I was seeing red admiral butterflies and hanging laundry out on the line. My raspberries were leafed out and my Jacob's ladder was putting out buds. This year... not so much.